Last week the consumer electronics show (CES2014) was on in Las Vegas. A lot of new tech was on show from 4k ultra hd TVs to e-ciggs! To accompany the show an iPhone app was released to help delegates find stands, each other, talks and panel discussions. As well as all this a scavenger hunt was built into the app using the new iBeacon technology available iOS7. The purpose of the hunt was to find each the beacons located around the show, when you are in range of a beacon you get notified and then the beacon is marked as found in the application. First to find all the beacons gets a prize.... W00t! So what is an iBeacon? 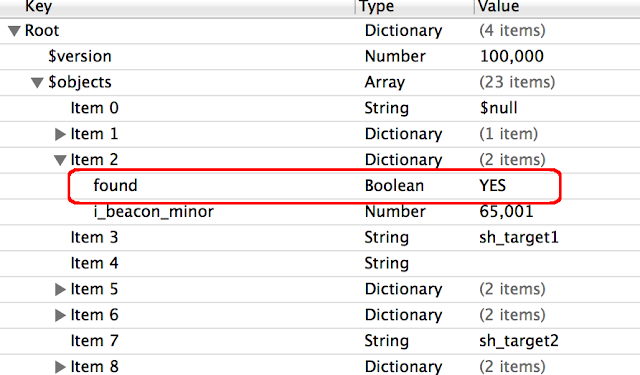 The Apple web site describes them as…. "iBeacon is a new technology that extends Location Services in iOS. Your iOS device can alert apps when you approach or leave a location with an iBeacon. In addition to monitoring location, an app can estimate your proximity to an iBeacon (for example, a display or checkout counter in a retail store). Instead of using latitude and longitude to define the location, iBeacon uses a Bluetooth low energy signal, which iOS devices detect. To learn more about Bluetooth technology, see the official Bluetooth website." This is broadcast and the iOS application is scanning for the UUID, you can also include the major if this is not likely to change. 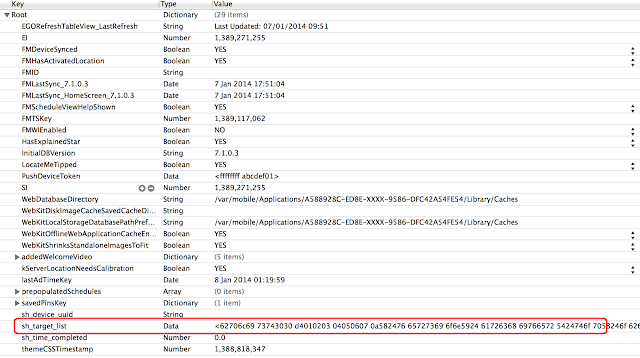 When they are found by the application it does something, e.g. calculate proximity let the user know they are close by or have just left the area. A better technical write up is available here. Also the Apple developer documentation is available here. There is a lot of hype starting to surround them and that seems to have gained since CES2014, I guess many of the journalists at the event saw the scavenger hunt. (See links below). How was I going to win the competition without moving to far? I installed the CES application on my jailbroken iPhone and had a nose around. 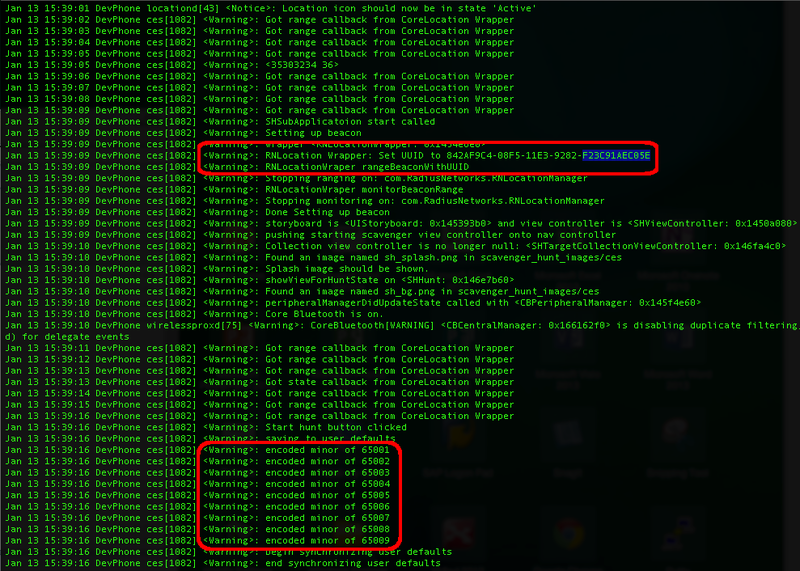 I used libimobiledevice to start pulling back the syslog to my laptop, you can also do this using the iPhone configuration utility too. I prefer idevicesyslog in libimobiledevice a it doesn’t jump around so much on the terminal when you are looking at the console/log. Now I had these all I needed to find was the Major and I could spoof beacons. 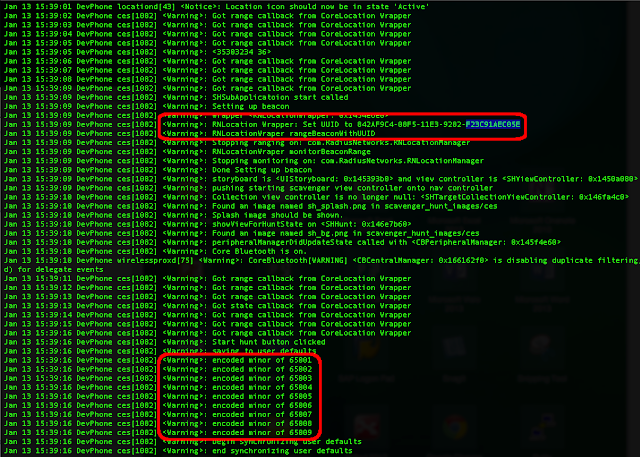 I ssh’d onto the device and located the application, dumped it and decrypted it using clutch. Clutch is a favourite of crackers but also very handy for hackers / pen testers to dump and application to be read in IDApro, hopper, class-dump-z or whatever. I ran strings on the binary, which showed up a few references to beacon and UUID but nothing to concrete. No major found here. 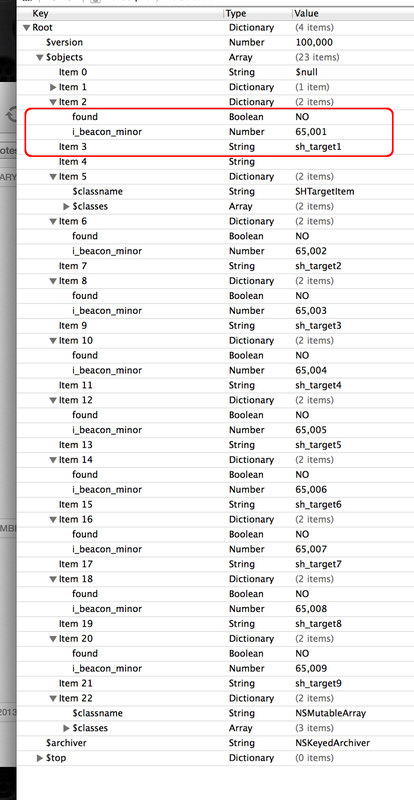 I continued to look around the sub directories of the application and found a few SQLite databases which looked promising, the names of the tables sounded like they would hold the details of iBeacons that were found. I looked inside each of the tables but again, nothing. I grabbed it and chucked it into a hex 2 ASCII converter available on the internets... Hmm looked a lot like a binary plist. 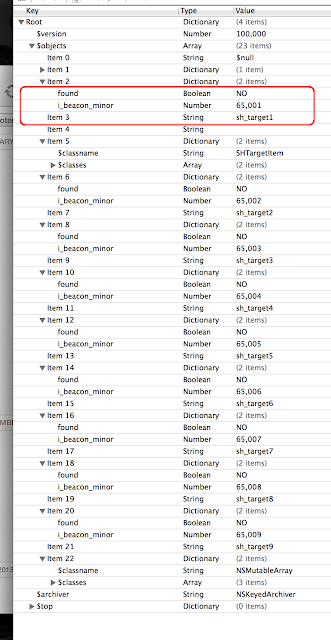 Now I had a plist I could look at in Xcode or any other text editor. 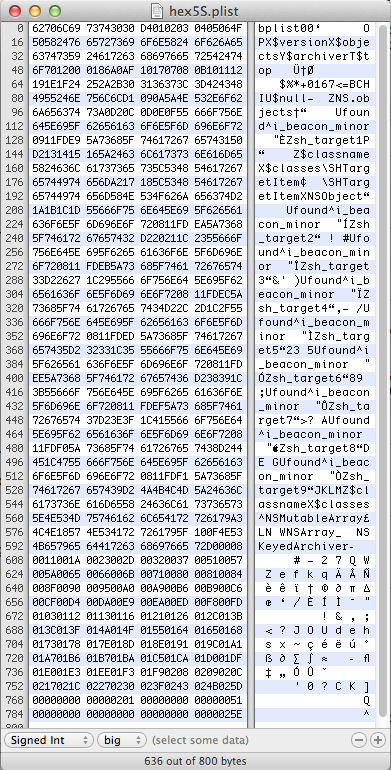 Once opened, it was easy to see the dev had embedded the details of a found beacon inside the plist and also the minor id’s, which matched up with what I had found in the log. 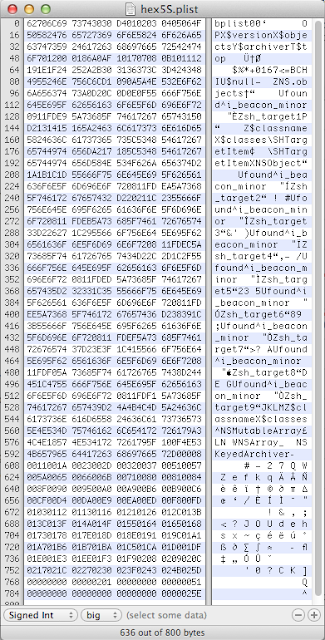 This left me with two options, I keep looking for the major and spoof each beacon or I see if I can set the individual beacons to found = YES in the plist. After hunting around a little bit longer for the major I decided the quickest route to success would be by trying to set the found key to = YES. Grab a hex dump of the modified plist and copy hex back into the default preferences plist. Convert the default preferences plist back to binary and then copy over to my device and replace the old file. Once pasted into the default preferences post I now had all I needed to win. If you are planning to use iBeacons for prizes or some kind of promotion code then I would suggest you use a web server backend with reasonable protection to stop this kind of hack, it wasn’t that hard and could be done pretty quickly. If you believe the hype iBeacons have a big future, it will be interesting to see the implementations and how people secure them properly.